Dean Koontz hits your darkest fears with this deadly thriller. Going inside your mind and making you afraid of yourself and what you are capable of. He targets mind control and not having control over your own thoughts or actions. It is a truly horrifying concept that comes from one of the great creators of thrilling fiction. 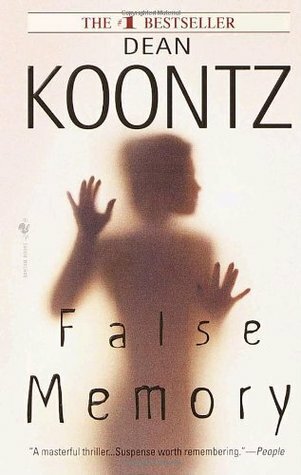 False Memory has just a creepy tone to it that carries throughout the whole novel. It keeps you on the edge of your seat because it is impossible to put down. There are a bunch of twists and turns to haunt you on every page. It truly drags you through the realm of insanity. There is a light at the end of the tunnel, but it all seems unattainable. The characters in this book are extremely interesting. This is especially true at the beginning when it appears that they developed crippling mental illnesses out of the blue. As the book progresses, the characters only become stronger and stronger. This novel had everything that I really enjoy. Great characters that you can root for, a thrilling story that is fast-paced and eerie, great writing that doesn’t drag on and get boring, and ultimately and ending that I enjoyed. The length of this book was a bit intimidating because of how large my TBR pile is, but once I really sat down with it, it was easy to finish it fairly quickly and I really recommend it for fans of thrillers.